Potholes and cracks. Every commuter’s nightmare. If only the problem could fix itself! Enter Congrui Jin and her team at Binghamton and Rutgers universities. They filled in the cracks by hiring some self-motivated construction workers. Who? Fungi! AKA – mushrooms. But fungi need to eat. And the street doesn’t have leftovers like the back of your fridge. What’s a hungry ‘shroom to do? After testing twenty different kind of fungi, Jin found one that could literally eat CONCRETE – that’s right, the street itself! Even more amazing, the growing fungus left behind a trail of hardened minerals. This could naturally and perfectly fill in the cracks! But there is still a bumpy road ahead to making fungi withstand working life. Researchers are still studying how the fungi reproduce on concrete. And that’s important . 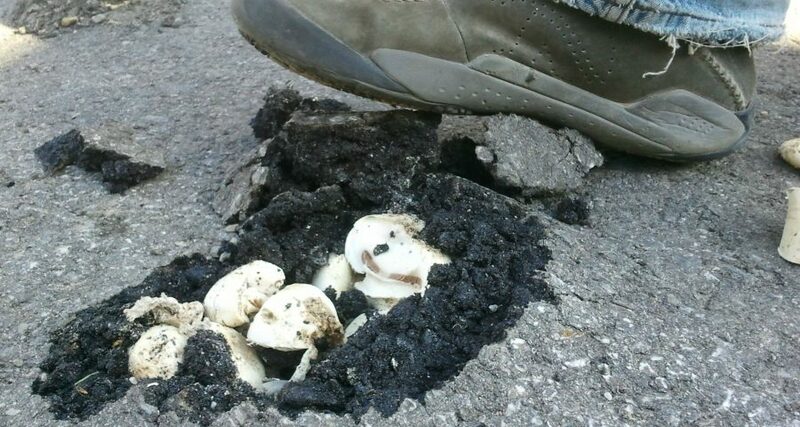 Because fungi need to live long enough to fill the next pothole. Next project: making them cute little orange construction hats. We can dream!